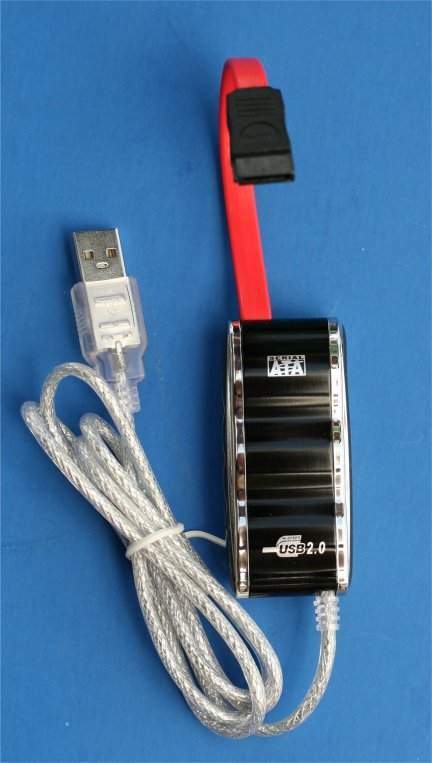 Serial ATA (SATA) to USB 2.0 Cable Converter Adapter with Power Supply The Hi-Speed USB 2.0 to Serial ATA (SATA) Drive Adapter creates a bridge between one USB 1.1/2.0 port and one Serial ATA or SATA-based mass storage device port. The USB 2.0 to SATA Drive Adapter turns any SATA hard drive into a convenient external drive. Easily transfer files from computer or notebook, back up files, or store large file archives on hard drives. The Hi-Speed USB 2.0 interface provides for easy installation with its Plug and Play design. The adapter supports all existing Serial ATA SATA drives 2.5" or 3.5". Windows 98SE/ME/2000/XP/Mac OS X (Driver ONLY necessary for Windows 98SE). Supports SATA CD-ROM/R/RW DVD-ROM etc.